When I’m asked to explain how social pensions can mark a turning point for the people receiving them, the story of Kajubi & Nakiwanda in Uganda immediately comes to mind – an older couple who, despite losing everything during war, are now able to afford the church wedding they had always dreamed of. 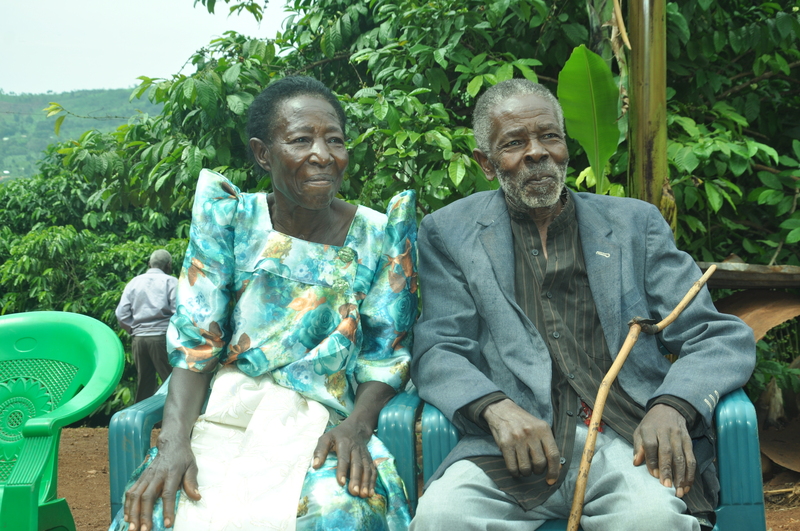 Kajubi & Nakiwanda were farmers until 1981, when guerrilla warfare forced them to flee their home. Kajubi was shot in the chest and, although the 75-year-old survived his injuries, he was left permanently disabled. They lost four of their five children during the war. They also lost all of their livestock – their only form of income. For the next several years, they struggled to get by. The positive turning point for this elderly couple in rural Uganda came a few years ago, when they started receiving the Senior Citizens’ Grant. With their first payment, they invested in a pig. Soon they had grown the herd, from one boar, to several pigs. This livestock provides a steady source of regular income for the couple. Not only that but, beyond monetary measures, the couple are now planning a church wedding – something they had not been able to afford before. Stories like the one told by Kajubi & Nakiwanda in Uganda abound. 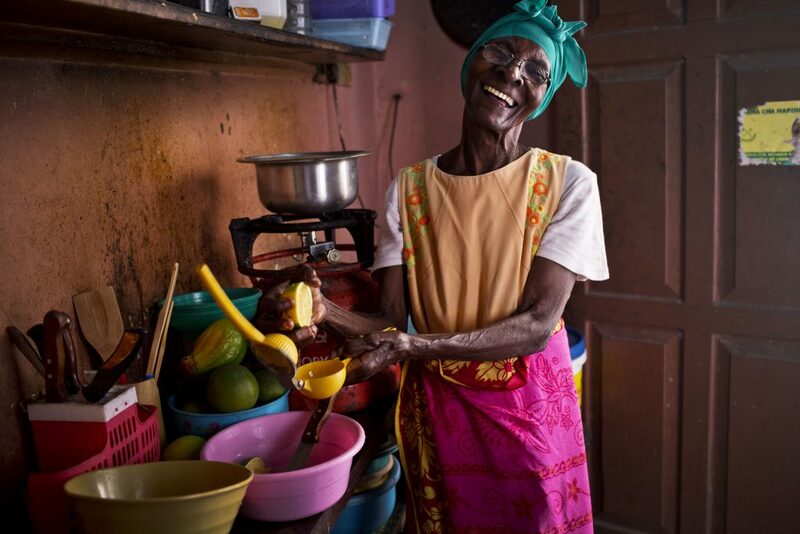 Cash transfers (in this case, in the form of a social pension) bring about changes to people’s lives beyond income – by influencing their dignity, their sense of belonging, and their ability to provide for their families. Several different studies have pointed to the effects of social pensions on what is termed ‘subjective wellbeing’ (i.e. non-material dimensions of poverty or vulnerability). Moreover, the positive results of social pensions can also be seen within their wider local communities. In the case of Uganda, it was found that the pensioners’ new income autonomy led to a sense of contribution towards local communities – brought about by sharing the benefits of the transfers. All individuals – regardless of their country of residence, gender or age – are exposed to a wide range of risks and vulnerabilities linked to the different stages of their lifecycle (including birth, death, illness or disability, illness or disability of a family member, care issues, loss of employment or income source, job-related accidents, war, among others). Cash transfers improve income security to overcome or mitigate some of these vulnerabilities. International evidence has also demonstrated that social pensions have resulted in a significant injection of cash and opportunities into local communities, thus contributing towards overall economic growth and benefiting local economies. Studies have suggested that beneficiaries use transfers to improve their household members’ welfare (nutrition, health, education, among others), but also have a broader impact in their communities by injecting that liquidity. 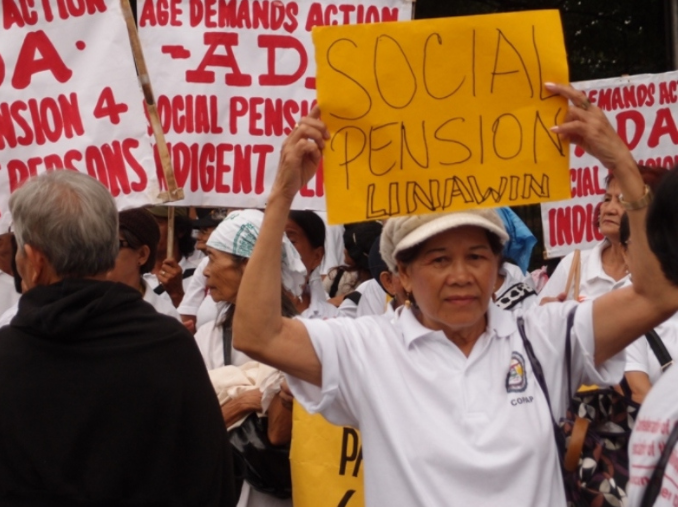 Can low- and middle-income countries afford universal social pensions? So, given all of the evidence in terms of positive effects on individuals, households and at the wider community level, can low- and middle-income countries actually afford universal social pensions, a step towards social protection floors? There is ample evidence in the literature on social pensions that it is affordable for low- and middle-income countries to move forward on this path and that it is possible to gain national support in investing in inclusive social protection schemes. A recent study by HelpAge, for example, examines the feasibility of a universal social pension in the Philippines, and provides some of the options to create the necessary fiscal space. Moreover, this discussion paper on the price of income security for the elderly considers that the cost for many countries is indeed affordable. In the case of Latin America and the Caribbean, these calculations state that Central American nations would be able to finance a basic universal social pension with less than 0.7 per cent of their national GDP (setting the age of eligibility at 75). That percentage would be 0.6 for South American and 0.8 for Caribbean countries. Although there has been a considerable push towards demonstrating the affordability and opportunities of fiscal space to invest in universal social pensions as building blocks towards inclusive lifecycle social protection systems, there is also politics behind these decisions. As such, the political economy behind the support for inclusive lifecycle social protection policies also needs to be addressed. Back in November of 2017, at a public event held in London on the Senior Citizens’ Grant, Ugandan MPs described some of the political debates around the social pension and stressed the importance of engaging political actors. So, might this be an opportunity to reflect on the positive effects cash transfers (like social pensions) might have on the welfare of beneficiaries beyond monetary benefits? Cash transfers can also be an enhancement to our dignity as human beings and boost our aspirations, as the story of Kajubi & Nakiwanda tells us. Alexandra Barrantes is the Senior Social Policy Specialist at Development Pathways. She has more than 18 years of experience in social protection, poverty reduction, economic, social and cultural rights, and development. Thanks for this blog post describing how accessible it is, even for LMICs to ensure that people of all ages can afford a decent living standard.